A South African member of parliament is getting divorced after he inadvertently sent an amorous text message meant for his mistress to his wife instead, according to South African media reports. New National Party (NNP) MP Alie van Jaarsveld typed a three-screen long message to party researcher Renee Thompson, with whom he was having an affair. It read: "I long for you. We can't sleep apart. Renee, I am more in love with you than I was with anyone in my life. Come sleep with me please. But a slip of the finger sent the message to Mr van Jaarsveld's wife of 30 years, Anne Marie, Die Burger newspaper reported. Mrs van Jaarsveld said she was shocked and revolted by the message. "I was devastated and still am," a reporter for the Herald newspaper quoted Mrs van Jaarsveld as saying when she found out about the affair. "My self-respect and self-esteem have been cut to shreds." Mr van Jaarsveld declined to comment, other than saying his life was personal and it was normal for couples to divorce. Just recently, I was dating a man named Miguel but everything changed when he sent me the wrong text message. He was supposed to send the message to his ex-boyfriend (who he supposedly broke up with) but accidentally sent it to me. I was devastated. Men can be pigs. Yes, I had been working away for few months overseas and just landed in London. I sent a steamy text message to my wife basically asking her to get "ready for me". Unfortunately my wife is called "Deb" which is just after my "Dad" so he got the message instead! I've done it twice - once when I sent a message to my lover talking about all the things I wanted to do, that one went to a work colleague - oops! Then the other day I sent a message to one of my friends complaining about one of the others, and because I put the other friend's name in the text, my brain decided to send it to her. She was not happy, as it was certainly not complimentary!!! I am always mis-sending text messages but luckily they are just chat ones. I am not having an affair so amorous ones go to my partner. However I am sure one day I will send it to my Mum! Yes, sadly, a few years ago, I broke up from a 3 year relationship and this girl was really hurt by my decision to end. But just after we broke up, I started innocently going out with different girls. 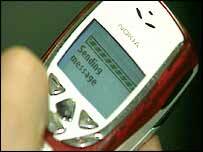 I sent off an SMS to a girl who fancied me and visa versa. It was a little steamy, but I sent it off to my ex instead by accident! Poor thing, she (my ex) almost got a heart attack! I still cringe when I remember this happening.